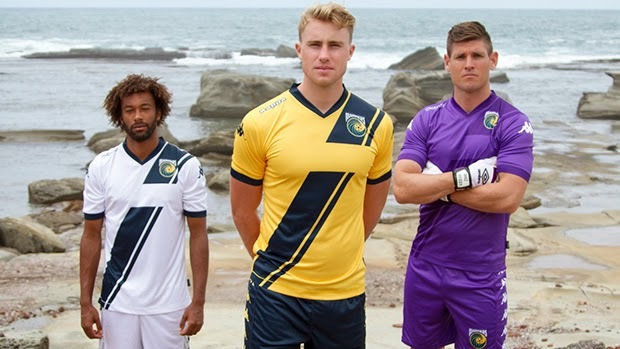 Central Coast Mariners players will sport a fresh look for their 2015 AFC Champions League campaign, with a classic sash being introduced to the Club’s Kappa kits for the first time. The Mariners’ first choice kit for their fifth foray into Asia’s premier Club competition features a yellow top with navy sash, teamed with navy shorts and yellow socks. The Club’s second choice kit features a white shirt with navy sash, in addition to white shorts and socks. And Liam Reddy and Matt Nash, the Club’s custodians, will have the choice of all purple, all pink, or all green goalkeeping attire throughout the Club’s involvement in competition. Each kit maintains the V-neckline introduced by the Club for Hyundai A-League season ten, and features unique detailing on the upper back – four palm trees to signify the club’s home and history. Moreover, the writing “AFC CHAMPIONS LEAGUE 2009, 2012, 2013, 2014, 2015” has been added to chronicle the Club’s proud involvement in Asia’s top team tournament.